"Have you done the Gaspé Peninsula?" is a common question, and one we can answer "yes" to now. The peninsula has a near mythical reputation amongst Québécois with lots of people, many who have never been there, raving about its beauty. 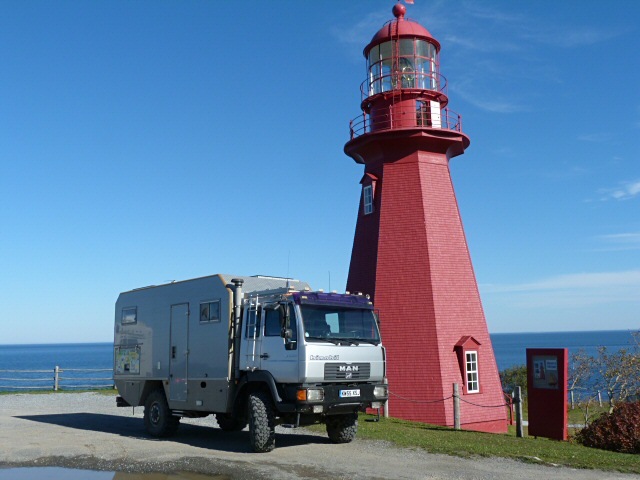 We drove about 800km round the Gaspé Peninsula from Trois-Pistoles to Pointe-À-la-Croix. Whilst some parts of this drive were very attractive and interesting (see below) a lot of it is just a continuous sprawl of pretty houses and villages with occasional gaps between the houses where you can see the sea. Often the only indication that one village has ended and the next one has started is the very brief change in speed limit! 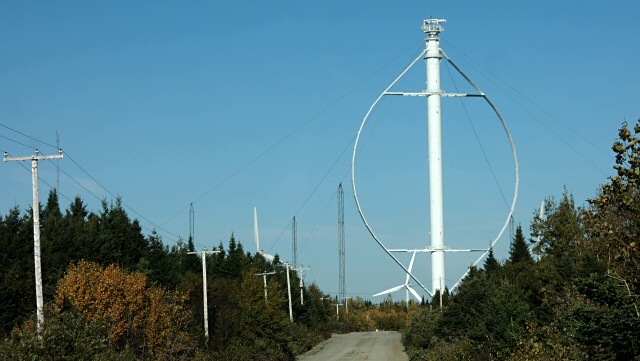 Although not what the Gaspé Peninsula is most well known for a visit to the world's largest vertical axis wind turbine (VAWT) at Cap Chat is highly recommended. 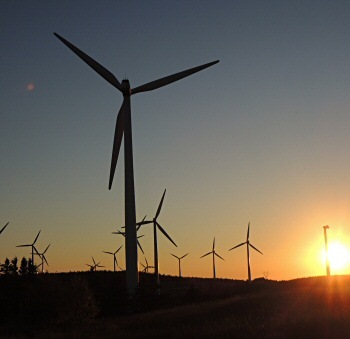 Most modern wind turbines use a horizontal axis (see right) however when the wind direction changes significantly they must be stopped, rotated to face the wind and then allowed to re-start. 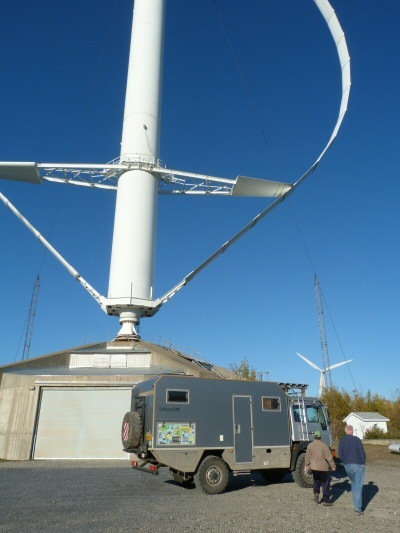 Alternatively you can build a wind turbine with the axis vertical, this type of wind turbine will work equally well with any wind direction. In 1987 Hydro-Quebec began operating the world's largest VAWT at Cap Chat for research purposes. It generated 3.8 Megawatts (considerably more than even the largest HAWT) but ran for only five years. Nothing larger has ever been attempted! It is monumental in scale and has been open to the public for 25 years! Very well worth a visit. One of the advantages of a VAWT is that the generator can be on the ground rather than 50 metres in the air. In this case the 3.8 Megawatt generator is housed in the concrete building behind Man . Apparently there are ten times as much concrete below ground as above. The turbine has been unused for 25 years and it has been turned into a rather geeky tourist attraction. 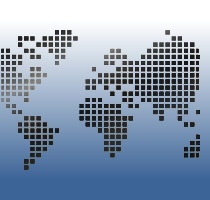 There are two types of tour available (both in English and French). 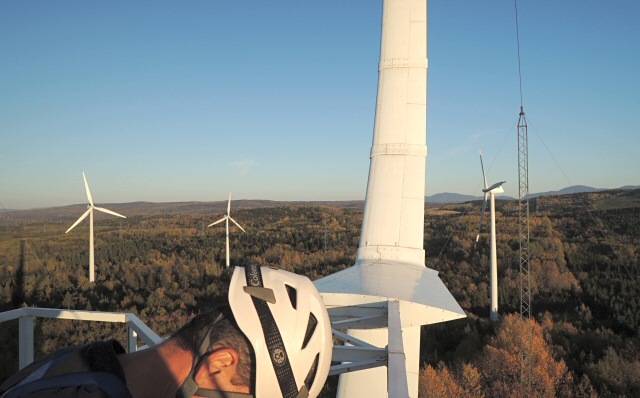 You can tour the ground based parts of the turbine or you can climb it. We did both. Most HAWT use a variable ratio gearbox between the turbine and the alternator so that they can produce 60Hz or 50Hz directly, this VAWT is directly coupled to its generator and because of the variable slow(ish) rotation of the turbine its output is first converted to DC then inverted to 60Hz. This type of VAWT must be spun up to speed before it starts generating power (it will not start by itself) so the generator also acts as a motor. The building on the left houses the 3600 volt battery bank used for starting. Naturally there has to be a way of stopping a VAWT in emergency, for example when the wind speed exceeds the maximum safe speed. 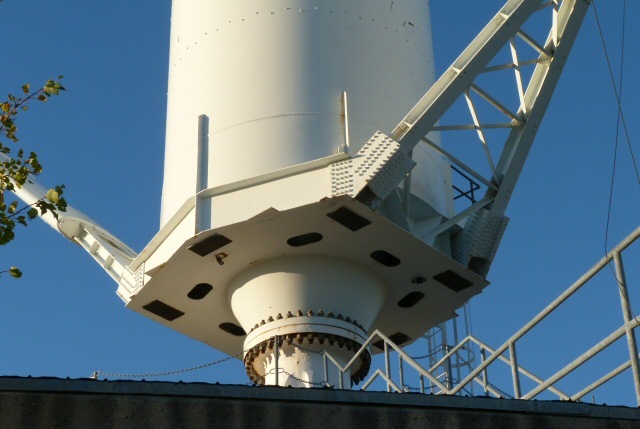 This turbine has "air brakes" that extend out of the blades of the turbine, however if these fail it also has four massive air pressure operated disc brakes (the white structure above the generator). As a last resort the output of the generator can be short circuited, whilst effective this would probably have destroyed the generator. 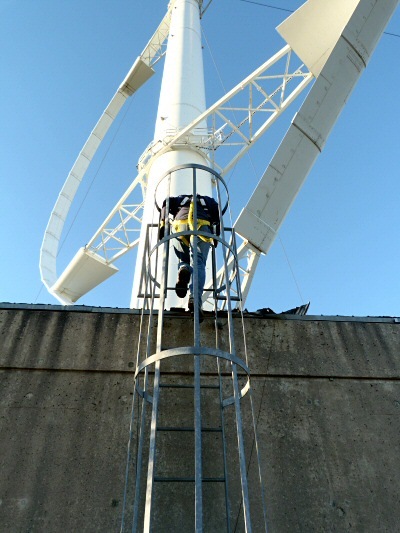 To climb the 110 metre structure you first climb on to the roof of the generator building. 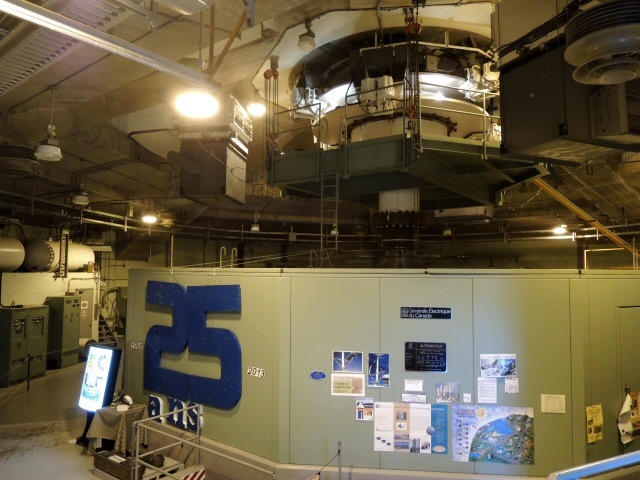 Then you climb into the base of the central cylinder (in operation this 5 metre diameter, 100 metre tall cylinder would be rotating at up to 18 RPM. 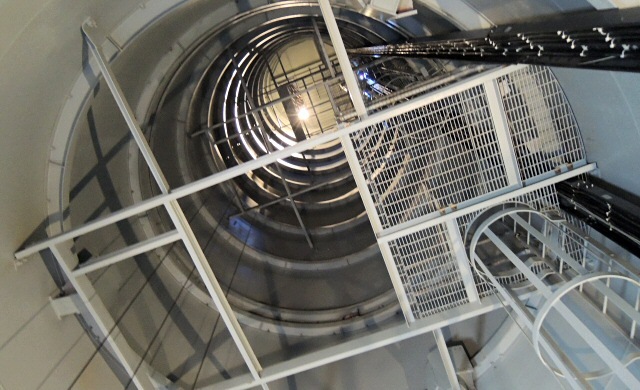 The rest of the climb is inside the body of the turbine as a series of vertical metal ladders. The view, even one third of the way up the turbine at 35 metres is impressive. 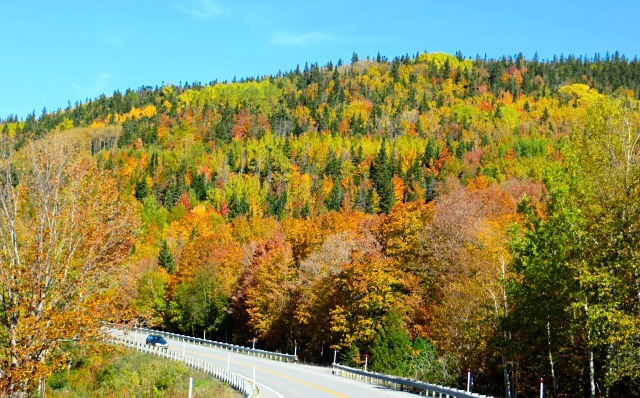 As you near the tip of the peninsula, at this time of year, the trees are impressive, if a little garish. 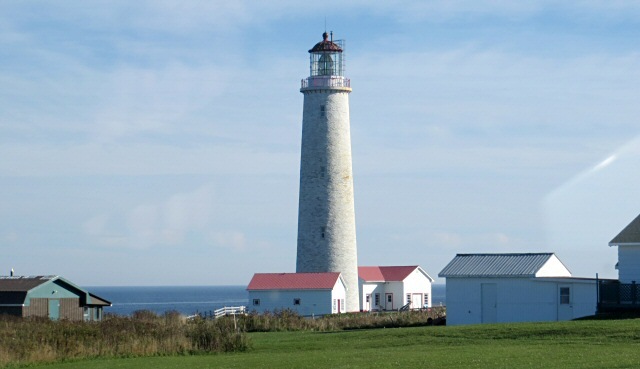 Forillon National Park is one of the "must see" parks of Canada with excellent whale watching. 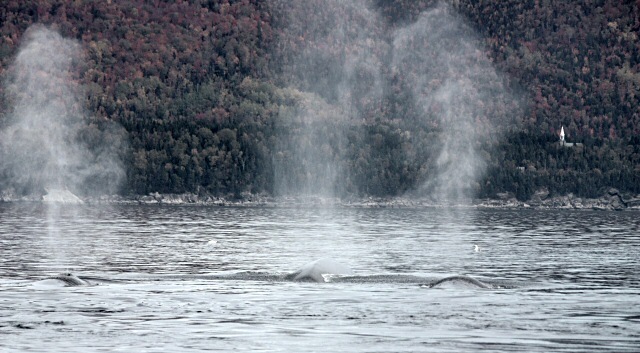 Here you can see multiple finback whales and even blue whales. Often the waters around Grande-Grave are so clear you can see the whales underwater.